Advocates of the established hypotheses on the origins of the Synoptic gospels and their interrelationships (the Synoptic Problem), and especially those defending or contesting the existence of the "e;source"e; (Q), are increasingly being called upon to justify their position with reference to ancient media practices. Still others go so far as to claim that ancient media realities force a … radical rethinking of the whole project of Synoptic source criticism, and they question whether traditional documentary approaches remain valid at all. This debate has been hampered to date by the patchy reception of research on ancient media in Synoptic scholarship. Seeking to rectify this problem, Alan Kirk here mounts a defense, grounded in the practices of memory and manuscript transmission in the Roman world, of the Two Document Hypothesis. He shows how ancient media/memory approaches in fact offer new leverage on classic research problems in scholarship on the Synoptic Gospels, and that they have the potential to break the current impasse in the Synoptic Problem. 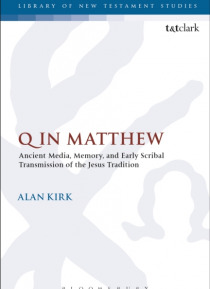 The results of his analysis open up new insights to the early reception and scribal transmission of the Jesus tradition and cast new light on some long-conflicted questions in Christian origins.